Last week, a girlfriend’s daughter turned ONE. She is such an adorable baby. She had a mermaid-themed birthday party complete with a small waterside for the bigger kids (by bigger, I mean 4 year olds). The mermaid also took a couple turns on the waterslide and she loved it too. Wouldn’t you know it, I do not have one single mermaid stamp in my stash. I may have to fix that problem, but for now, I had to make do with what I have. I pulled out my retired By The Tide stamp set. When I clear out my retired stuff at the end of the catalog, I usually have a small stack of stamps that I hang onto for a while and the rest I sell off so I can replenish with new products. 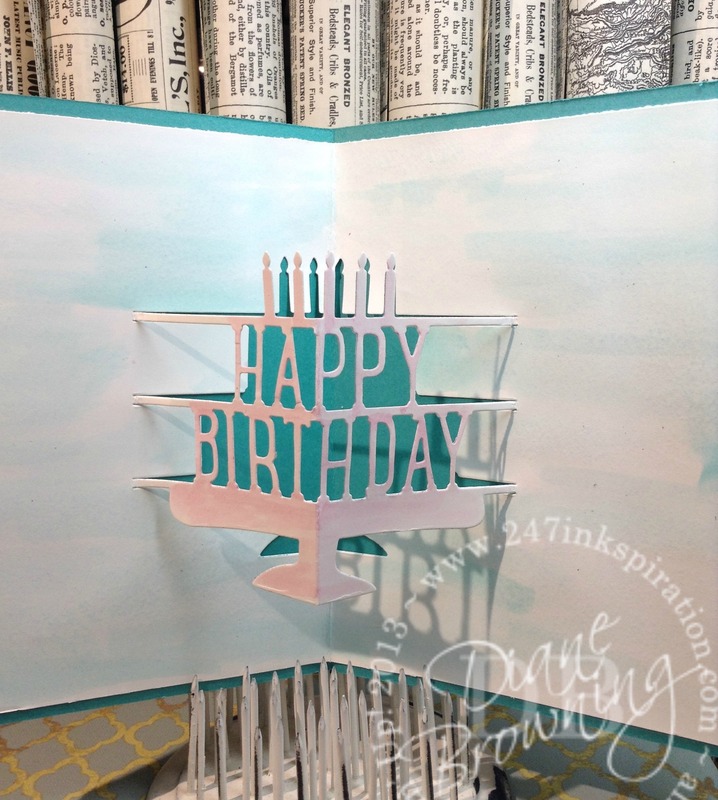 The background is just simple color wash with an Aquapainter and Bermuda Bay ink. I really thinned out the ink so the wash would be really light. Just keep adding more water until you get a color you’re happy with. Be sure to test it on some scratch paper before you use your nice paper. You can always do a second coat if it’s too light. The coral is stamped in Gold ink. 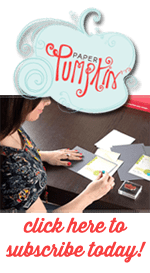 To get the layered look of the coral, ink the stamp, then stamp twice in two different places, and repeat until you have enough coral on the card. I finished it off by stamping a one final coral right in the center. 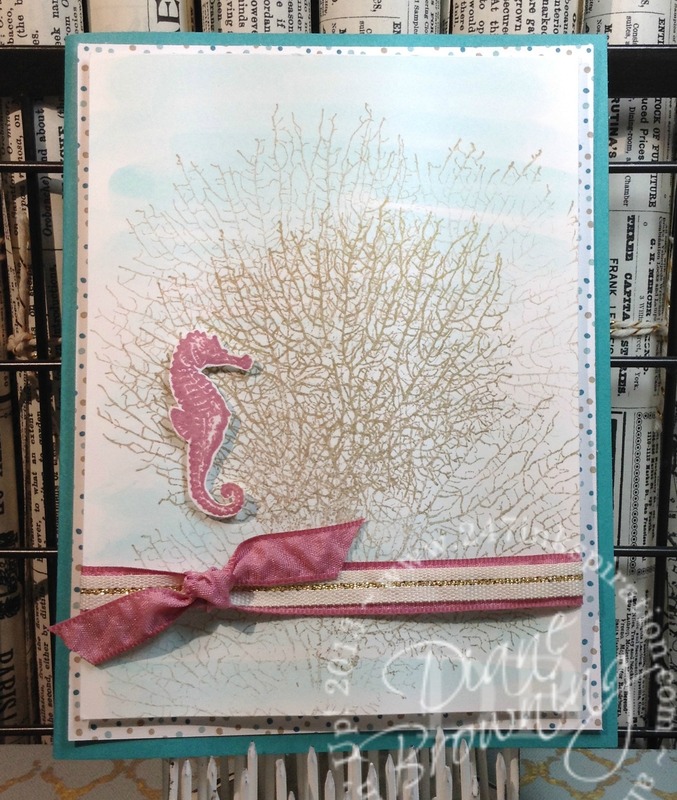 I stamped the seahorse in Sweet Sugarplum to give the card just a little bit of pink. I used the pop-up Happy Birthday die for the inside of the card. And again did a Bermuda Bay color wash across the background and then used Sweet Sugarplum for the pop-up cake in the center. We have two different pop-up dies and they are so easy to use. There are guides right on the dies so you are sure to get the correct placement. They really do provide an unexpected surprise when the recipient opens the card.